With the 25th anniversary of The Princess Bride upon us, actor Cary Elwes, who brought the character of Westley to life, has penned a memoir about the making of the family classic that fans of the movie should not miss. Interesting, funny, with lots of insight from various cast members, this book is a delight to read. As You Wish begins with Cary Elwes recalling a note his agent sent him marked only with the word ‘Important.’ Upon calling her, Elwes learned that he was being considered for a role that would eventually change not just his career, but really, his entire life. Producing partners Rob Reiner and Andy Scheinman were interested in meeting Elwes to see if he was the right man to play one of the leads in their upcoming movie. When The Princess Bride hit movie screens, it received good reviews although viewers didn’t flock to it in droves. While not a major hit, as soon as the home video market caught on, so too did The Princess Bride.Today, it is considered a classic, a movie that the whole family can enjoy. 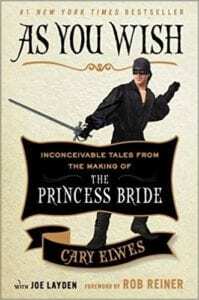 So too, is As You Wish - thank you, Mr. Elwes, for bringing the back-story of The Princess Bride to life in a book fans will love. Quill says: A quick, fun read about a wonderful movie. If you enjoyed The Princess Bride, you’ll love this book.